Owners of the Gen 1 Prius (model years 2001, 2002, and 2003) are part of a group affectionately called “early adopters” and with that membership comes the burden of techno-drama (exclamation points, noises, et al.). In that vein Luscious Garage could be equally named “Early Adopter Therapists”. If it’s happening, we’re quite likely to witness it within our walls and to have the resources to help. The “classic” Prius has several unique features, including an undersized traction motor (a.k.a. 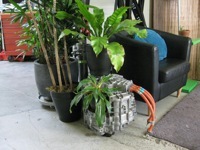 MG2, the motor-generator directly connected to the wheels) of 30kW, versus the current model’s 50kW. It also uses outdated transmission fluid, Toyota Type T-IV, which is more prone to stress versus Gen 2’s WS (“world standard”). Ventures into the transaxle case have uncovered additional rumor about a manufacturing defect chronicled by Art’s Automotive in Berkeley. (Pic of torn pickup tube seal, courtesy of Art’s website.) It also suffers from voltage deficiency, relying on the main pack voltage rather than a boost converter (as with the Gen 2), which Physics translates to higher amperage and therefore higher load on circuitry. 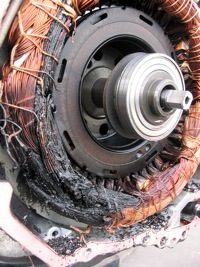 HV leaks can be isolated using rudimentary techniques in the service bay. A test drive with the scan tool reveals overheating problems. The most recent patient, with only 61k miles on the clock, read over 300 degrees Fahrenheit after a mile of highway driving. The fix is simple but expensive: replace the transaxle. “Isn’t this exorbitantly expensive and enormous component serviceable,” you ask? Well, yes, but you’ll pay as much in labor suffering through the process. 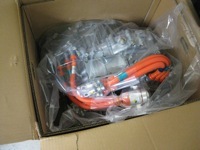 Reference again the chronicles of Art’s Automotive “Rebuilding a Toyota Prius Transaxle”. 3.) Once again, there is a far better alternative now! 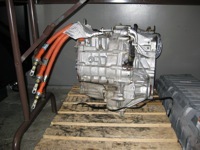 Click here for the updated blog on transmission repair. NOTE: Besides parts these prices also reflect a discounted labor rate of $100/hr. We really want to help owners keep these cars on the road. Is it worth it? The Gen 1, despite its flaws, is a feat of engineering and an overwhelming success of a vehicle, compared to all but the Gen 2 Prius (and perhaps its decendants: Camry, Highlander, and Lexus varieties). But the “worth” of fixing ultimately depends on the attitude of the owner. Hardly criticism, the story of Prius Transmission Failure is a cautionary tale of proper maintenance: change the transmission fluid every 30,000 miles, for all hybrids of this design (Toyotas, Fords, and Nissans). It is the only service item in direct contact with the high voltage motor-generator(s) and the power-split device, to cool as well as lubricate these crucial components of the hybrid system. For inquiries on transmission problems and repair, use the LG contact form.